Crazy for durian? In love with ice cream? 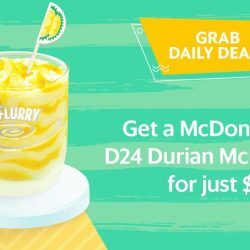 Savour the best of both worlds for ONLY $1 with Grab's latest Daily Deal: Get a McDonald’s® D24 Durian McFlurry® for ONLY $1! (Normal price: $3.10) T&Cs apply. Till 17 Jun 2018 Grab: Enjoy $2 off Your Ride with Every GrabPay Transfer or Transaction! Enjoy $2 off your Grab ride with every GrabPay transfer or transaction you make! 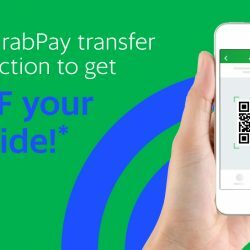 Between 14 to 17 June 2018, make up to 3 in-store GrabPay transactions^ OR GrabPay peer-to-peer transfers of at least $5 each. Within 15 minutes of making each successful transaction or transfer, you’ll receive a Reward for $2 OFF your next ride! 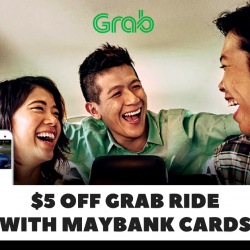 Till 6 Jun 2018 Grab: Get $5 OFF a Grab Ride with Maybank Cards! Recently there's not much taxi codes 🙁 Finally there's one now but only with Maybank Cards! 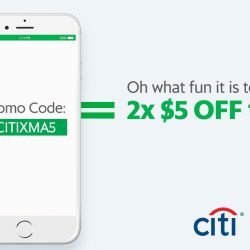 If you are a Maybank Cardmember, enjoy $5 off a Grab ride when you pay with a Maybank card using the below code! Valid till 4 June 2018, limited to 1000 redemptions only. 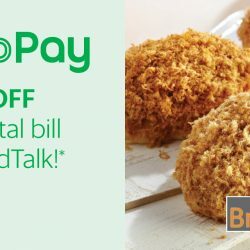 From 7 May 2018, while stocks last BreadTalk: Enjoy $2 OFF Your Total Bill with GrabPay! Get bread-y for this awesome deal! 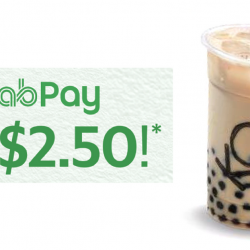 Use GrabPay in-store at selected BreadTalk outlets and enjoy $2 OFF your total bill, with a minimum spend of just $4. Valid from 7 May 2018, while stock lasts (limited redemptions available). Updated 5 Sep 2017 Save on Your Taxi Rides with These Latest Coupon Codes from Grab, Uber & ComfortDelGro! BargainQueen is here to help you save! 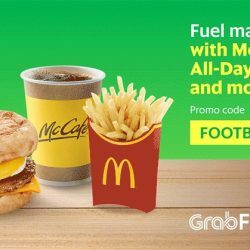 Whether you are going to work or coming home from work, going shopping or returning home from a fun night out, grab these latest coupon codes from Grab, Uber and ComfortDelGro to save on the fares! Share this with your friends and we will update whenever there's a new code! 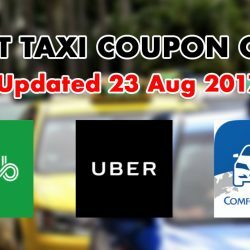 Updated 25 Aug 2017 Save on Your Taxi Rides with These Latest Coupon Codes from Grab, Uber & ComfortDelGro! Updated 23 Aug 2017 Save on Your Taxi Rides with These Latest Coupon Codes from Grab, Uber & ComfortDelGro! Updated 18 Aug 2017 Save on Your Taxi Rides with These Latest Coupon Codes from Grab, Uber & ComfortDelGro! Updated 16 Aug 2017 Save on Your Taxi Rides with These Latest Coupon Codes from Grab, Uber & ComfortDelGro! Updated 14 Aug 2017 Save on Your Taxi Rides with These Latest Coupon Codes from Grab, Uber & ComfortDelGro! Updated 8 Aug 2017 Save on Your Taxi Rides with These Latest Coupon Codes from Grab, Uber & ComfortDelGro! Updated 4 Aug 2017 Save on Your Taxi Rides with These Latest Coupon Codes from Grab, Uber & ComfortDelGro! Updated 1 Aug 2017 Save on Your Taxi Rides with These Latest Coupon Codes from Grab, Uber & ComfortDelGro! Updated 28 Jul 2017 Save on Your Taxi Rides with These Latest Coupon Codes from Grab, Uber & ComfortDelGro! Updated 24 Jul 2017 Save on Your Taxi Rides with These Latest Coupon Codes from Grab, Uber & ComfortDelGro! 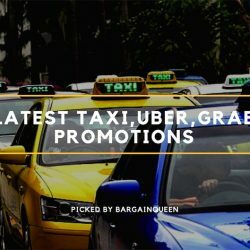 Updated 21 Jul 2017 Save on Your Taxi Rides with These Latest Coupon Codes from Grab, Uber & ComfortDelGro! Updated 20 Jul 2017 Save on Your Taxi Rides with These Latest Coupon Codes from Grab, Uber & ComfortDelGro!